The Institute of Chartered Shipbrokers (UK) in Sri Lanka hosted their flagship event, the 25th Annual Awards Ceremony which was held at Cinnamon Lakeside on the March 15, 2019. 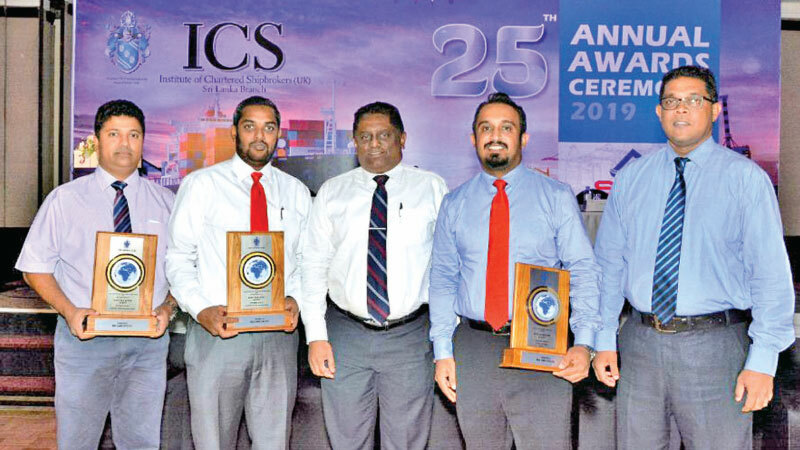 MSC Lanka (Pvt) Ltd picked up three awards for the night in 3 different categories, highlighting their exceptional performance in the Shipping Industry. This exclusive event was graced by Sagala Ratnayake, Minister of Ports & Shipping & Southern Development while the keynote address was delivered by Rauff Hakeem, Minister of City Planning, Water Supply & Higher Education. The Institute of Chartered Shipbrokers (UK) Sri Lanka Branch, is widely accepted as one of the professional bodies that sets the highest standards of professional service to the shipping industry. The Annual Awards Ceremony is one of the most looked forward to and significant events on the shipping calendar. It recognizes excellence in service through many categories in various regions, recognizing the best agents in customer service. MSC Lanka (Pvt) dominated at the Awards Night by taking home three grand awards which shone a light on their impeccable services and operations. The company won the “Best Shipping Agent” Award in “Overall Inbound Trade”, “Mediterranean Trade (exports)”, and “Gulf & Red Sea Trade (exports)”. Receiving these exclusive awards further stresses on the resources, the global network and the efficient and tailored service provided by MSC Lanka. MSC is a world leader in global container shipping industry, founded in 1970 and headquartered in Geneva, Switzerland. The company has been operating in Sri Lanka since 1997 and is the No. 1 customer of Port of Colombo, operating more than 13 main line services and 3 feeder services weekly enabling them to be one of the market leaders in the Shipping industry both locally and globally. MSC was recently recognized by The Port of Colombo, with the title of “The Most Outstanding Main Line Operator of the year”, based on the total container throughput handled at Port of Colombo in 2017.